Get help raising your credit score with the #1 Leader in Credit Repair! Change your life in as little as 3 to 6 months! Be smart about your credit. Call to begin your new life NOW. Have negative items that need to be removed from your credit report? We’ll dispute ALL of your negative items reported with the credit bureaus and creditors EVERY ROUND. Begin fixing your credit with us TODAY! If you have little to no credit history, we can fix that. Your assigned Credit Specialist will guide you through the best options for your goals and current situation. 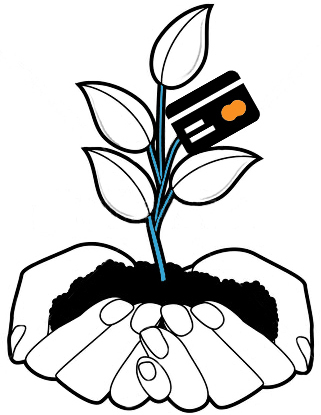 We make sure to get you approved for credit cards whether you have poor credit or a lack of credit history right now. Tell us your short-term and long-term goals! We will make sure we get you to them. You will be assigned a Personal Credit Specialist who will know you and your account on a personal level. He or she will give you an education on how to BUILD positive credit and maintain it once we get you where you need to be. We have seen our clients scores jump over 100 points in as little as 30 days. But individual results vary depending on many different factors. We are able to get superior results over other companies in this industry because we dispute ALL of your negative items each round. This also includes inquiries, which can be impacting your score negatively anywhere from 3-9 points EACH. This is not something most of our competitors offer. No matter what type of derogatory item you have ; bankruptcy, foreclosure, late payments, charge offs, collections, we can take care of it. 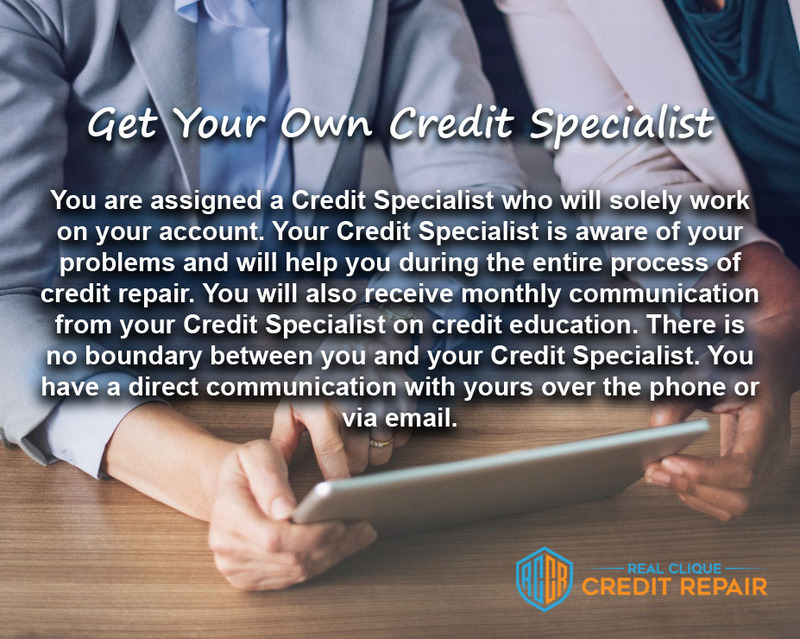 We can help by not only removing all of your negative items from your credit report, but we also coach you on ways to build positive accounts. We don’t just hear your issues, we listen, and we understand to provide you with the BEST solutions for your problems. We proactively engage in reviewing the market place to give us a broader view on what our clients want and need. We ensure you that with our experience, you are getting the most ethical and effective approach to repairing your credit. Professionally customized hard copy disputes to all 3 credit bureaus for every item, every round. Credit counseling and advice from your Personal Credit Specialist. Get a set price based on your Credit Profile. We DO NOT put you into a never ending billing cycle. Your service is great! My credit report is all cleaned up! I can’t believe it! The other two bureaus are almost clean too. Real Clique Credit repair Restored my credit almost instantly. I wasn’t so sure about it when i first talked to them but once i seen my credit jump up immediately i was very happy. i started at a 560 credit score, within 3 weeks i was up to a 620! Anthony at real clique credit is the best, always answers my calls when ever i had questions! I recommend Real Clique Credit Repair to all my friends and family. I am a very happy customer! Absolutely amazing job my credit has shot up and is still going up can’t wait to see how high it ends up. I highly recommend them to anyone! After being denied car loan, I started to look for ways to fix my credit. I came across real Clique Credit Repair and boy o boy was that one of the best decisions I’ve ever made. I have received a 114 point increase so far! I’m getting offers left and right and I am now thinking about getting a car I thought I would never be able to drive. You can’t go wrong with them! 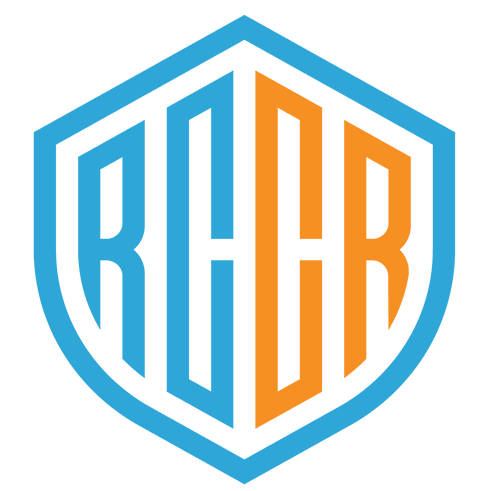 My experience with Real Clique Credit Repair has been simply a pleasure to work with in getting my credit repaired. If I had to describe them in one word it would be "AWESOME." In summary, they're hospitable, courteous and true professionals in what they do. I couldn't have chosen a better credit repair company! This group of knowledgable individuals are truly amazing. They have fought this relentless battle of cleaning up and keeping my credit score intact. Their prices are incredible and their attitudes are nothing short of becoming. There were times I would feel stressed out about something and Alex was always there to reassure me that he was already on the case. When I found this company, I found a gem! They are helping me accomplish my short and long term goals. I am close to my goal and will continue to work with them even after I feel my score is where I want it to be. Real Clique is Real Family! What a great company!!! I started off with Real Clique because I was drastically struggling with my credit. They've completely cleaned up my credit and I am completely surprised at how fast they were able to get results. Even, from the beginning they were very honest with me on what to expect. 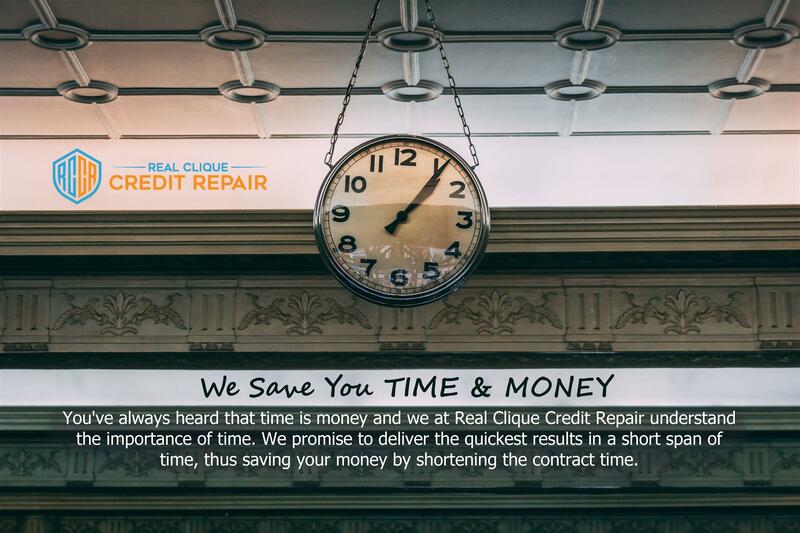 Today,I am very pleased to say that Real Clique Credit Repair is a really fantastic company and I highly recommend them to all. I highly recommend Real Clique credit repair... staff are well trained and unified communications - effectiveness >efficient is hard to compare. 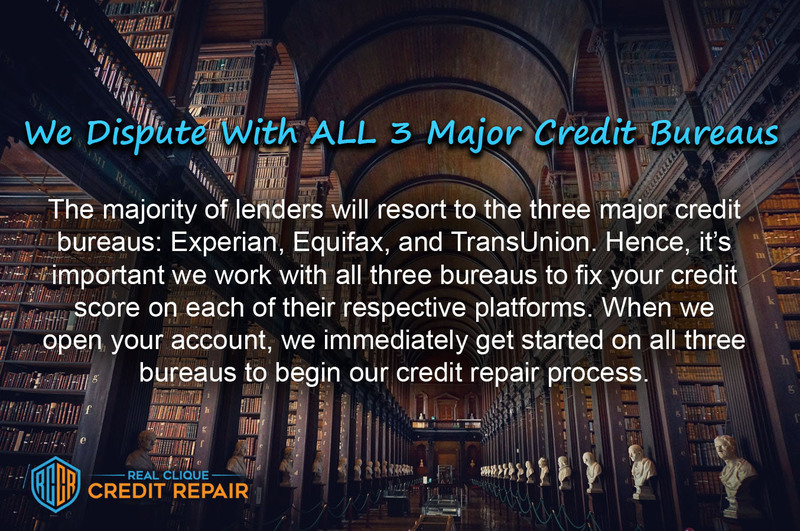 Within a month working with them positive results ..
We remove negative items from all 3 major credit bureaus! 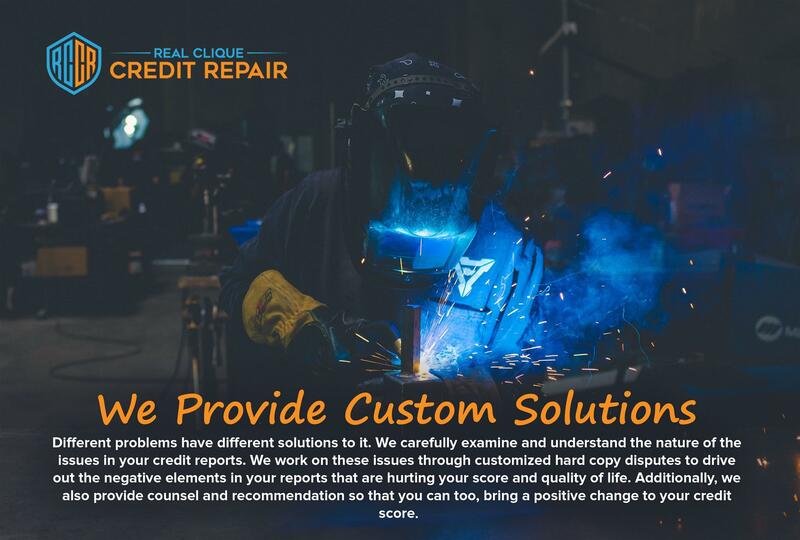 Real Clique Credit Repair is focused on giving you the second chance you deserve, financially, by disputing ALL your negative items every round on ALL 3 credit bureaus, and helping you BUILD POSITIVE CREDIT. With your personal Credit Specialist, you will gain the knowledge you need to maintain your new credit score for the rest of your life. Can you help while I’m going through a bankruptcy? Is Credit Repair worth it? Why? © 2019 Real Clique Credit Repair. All rights reserved.